New Home in a Hurry by McBride and Son Homes. This 2 story Row Home offers 3 bedrooms 2 1/2 baths and comes w/ rear entry garage. Includes full basement w/ bath rough, Level 3 Aristokraft Cabinets Throughout Home, Stainless Steel GE Kitchen Appliances, 42" Tall Kitchen Wall Cabinets, Luxury Master Bath with Walk In Shower w/ Marble Seat, White Six Panel Doors with Venetian Bronze Hardware, Open Spindled Railing at Stairway, Additional Can Lights, Oil Rubbed Bronze Lighting Fixtures, Concrete Back Patio, Upgraded Flooring, Professional Landscape Package. 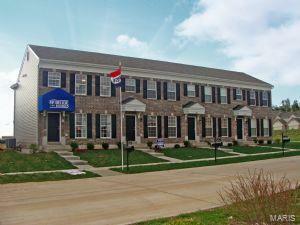 The Commons at Maryland Oaks consists of 25 row homes. This is a low maintenance community, where exterior chores will be taken care of. Maryland Oaks is very close to Westport Plaza which has offices buildings, restaurants, entertainment venues, and hotels. Photo images are of former Georgetown model home. Optional features may be shown. Consult with on-site sales for a list of included features.